Down & Dirty: 2-Row Pale and Honey malts with Citra and Mosaic hops. 89!? WTF!? Pfft.... This beer is awesome! Pours a light amber gold, with some unfiltered sediment floating around. Nice white bubbly head that laces well and persists around the edge of the glass. Smells like a ton of fresh mango juice, spiked with a touch of citrus and pine. Flavor combines tropical, citrus, and pine flavors seamlessly balanced by a clean malt sweetness. Feel is light and refreshing and would make you think you're drinking a SIPA, and has a nice bitter finish to it. Overall, this blends new school east coast and old skool west coast wonderfully. The only issue I have is that it is not year round! Cheers! 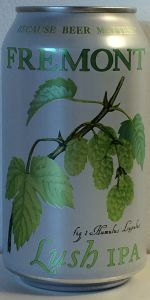 Another nice hop offering from Fremont. This ipa has a light mouth feel but is not lacking in flavor at all. Nice addition to the line up, especially in the winter doldrums. Spring is right around the corner. On tap at Growler Guys in PDX. The beer pours a bright golden amber color with good head retention and considerable lacing. The beer certainly looks nice enough. The nose just smells like a Fremont style of IPA (of which I've had quite a bit over the past few years). There's considerable dry citrus, light pine, onion, some holly and light tropical fruit. The flavor profile replicates the nose in this well balanced, dry and bitter on the finish IPA. Arguably, some more sweet malt might improve this beer a bit, but even so, this is an easy to appreciate and enjoy IPA. Alcohol is very well integrated into the flavor profile, and is pretty much unnoticeable. Nothing mind blowing here, just another solid, enjoyable IPA from Fremont. Like an angelic sunset, Lush IPA does look. Smells a bit soapy. Not Soapy Smith soapy, but just a lil soapy. Taste has Raul at a loss of words because he doesn't really know what's going on. Is it citrusy? Is it Piney? Is it floral? Is it malty? Yes! It's kind of everything, but in a good way, my peeps. And as a whole, the thang tastes hella fresh like my baby mama after a visit to Burke Williams. This beer is definitely Raul recommended. fremont always does an amazing job with the hoppy stuff, but this lush might be one of their best! its so good, simple in a lot of ways, and with an extremely familiar citra mosaic hop complexion, but this just is better than the rest of them for some reason, the hops are so fresh and forward, and the malt base really supports them well. i like the slightly richer color and body to this, its never sweet, but its just a little more substantial than many, and i think that allows for a much higher hop dose while retaining some semblance of balance here, really smart build on this. i like it being clear too, this is west coast style that tastes as dry hoppy and juicy and fruity as any of the haze bombs that are sweeping the nation, i appreciate this level of flavor potency and refinement together, its uncommon in this day and age. fresh citrus and pineapple notes abound in here, and its really quite fantastic overall, bitter enough in the end and nicely carbonated, tending toward dry, and more drinkable than it should be at this abv. exceptional ipa from one of the best, as fresh as it gets! mosaic citra magic! Beautiful brew: translucent golden hue, moderate cream-colored head, with very nice lacing and good retention. Aroma has an overly sweet pine resin note to it, hinting strongly of honey and flowers. Deep inhalations reveal touches of mandarin orange and grapefruit. Some biscuity malt as well. Flavor follows: initially grassy, then giving way to a sweet, honey-like hoppiness, and finished with a pine/resin/dank melange of hops. Almost like chewing on the aroma of flowers. Sweet chewy white bread from the malt. Reasonable bitterness. Seems like a beer that should finish drier. Easy drinking and lively. I can't figure out if this is a pretty good IPA, or an amazing IPA. It's an abnormal presentation of Citra, although it's pretty in line with normal Mosaic characteristics. I'm missing the juiciness I normally associate with Citra, and it's not particularly dank (for either hop). I think it's a lovely beer; others might find it's a tremendous beer. Really enjoying this, its light, very tropical, and a great mouthfeel all at the same time. Very balanced with just a little pine at the end. Will be buying a lot of this till Summer Ale comes out. After being in the PNW for four years I have had the opportunity to taste a lot of varied ales. Really enjoy all the different IPA's. This one just moved to the top of the group. Incredible holy taste with the best finish of all. Fremont nailed this one.